Here is the most complete guide available to the isolation, analysis, and synthesis of RNA. It covers everything researchers and laboratory workers need to know about the study of gene expression via RNA analysis–from the theory behind the methods, to actual problem–solving techniques. Step–by–step protocols are presented for each method. A careful presentation of the experimental formalities of these protocols enables specialists and nonspecialists alike to implement the methods easily in the laboratory. Each protocol is accompanied by the theoretical background underlying the experimental procedure and most chapters contain illustrations of typical results and troubleshooting tips. A Laboratory Guide to RNA offers a straightforward detailed account of experimental procedures, ranging from the isolation of RNA from a variety of cell and tissue types, detection analysis, and quantitation using a range of strategies, to large– and small–scale synthesis of RNA. This unique guide not only covers established procedures such as RNA blotting and nuclease protection, but also the latest protocols for quantitative PCR and differential display. Protocols addressing in situ hybridization are highlighted in an eight–page, full–color section that illustrates the power of the technique for detection of gene expression in tissues and whole organisms. 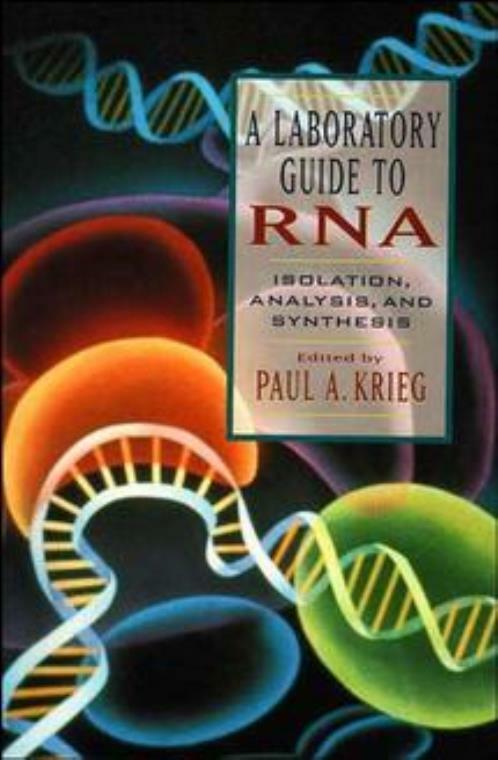 Featuring contributions from leading research laboratories and the biotechnology field, A Laboratory Guide to RNA: Isolation, Analysis, and Synthesis provides all the methods required for RNA analysis. It is the ideal laboratory guide for research scientists, graduate students, and lab personnel who need a solid reference on the analysis of gene expression at the RNA level. RNA Isolation from Cells and Tissues (M. Mehra). Isolation of RNA from Plant Tissue (T. Wilkins & L. Smart). Analysis of Polysomal RNA (O. Meyuhas, et al.). Primer–Extension Analysis of RNA (C. George & J. Kadonaga). In Vitro Translation of Cellular and Synthetic RNA (A. Kaminski & N. Standart). Quantitation of RNA Transcripts Using RT–PCR (F. Ferré et al.). Analysis of Messenger RNA by Differential Display (P. Liang). A New Methods for Full–Length cDNA Cloning By PCR (A. Chenchik, et al.). Whole–Mount In Situ Hybridization to Mouse Embryos (R. Conlon). Analyzing Patterns of Alternative Splicing (C. Smith, et al. ).